Could Pulling on the Leash Hurt Your Dog? Your dog pulls while walking on a leash which can lead to gagging and coughing. Your response may be to jerk the leash to stop him, but there can be long-lasting effects on his health. Obvious injuries caused by pulling and jerking are to the trachea and neck. Less obvious are the injuries to nerves and vertebrae which can cause permanent damage as well as lead to other medical issues such as organ damage, paralysis, or neurological issues. As an example, the collar rests right where the thyroid gland is and repeated pulling on the leash causes pressure on the thyroid, which can become injured. This may ultimately lead to hypothyroidism. The nerves in the neck that go down to the paws can be damaged when jerking on the leash, manifested by your dog's licking his paws (sometimes misdiagnosed as allergies). Similarly, he can also scratch his "armpits" or his ears. He can get epilepsy due to the compression of jugular vein in the neck, increasing the pressure in the vein and causing a seizure. Moreover, nerves in his neck can become compressed, which can lead to paralysis in his limbs. Particularly harmful are retractable leashes because when your dog is running and gets to the end of the leash, he gets jerked very quickly with all the force that he was using to run. All of that force goes into his neck. Other collars can cause injuries such as choke chains. They tighten on your dog's neck rather than just putting pressure on it. The theory behind choke chains is that both the sound and the pressure will cause a startle response resulting in your dog stopping pulling. However, most people do not release quick enough, and, compounding that, they do not put the chains on correctly. Prong collars can be dangerous as well because even though the pressure is distributed around your dog's neck, one of the points can be directly over your dog's larynx or thyroid having the same problems as previously mentioned. 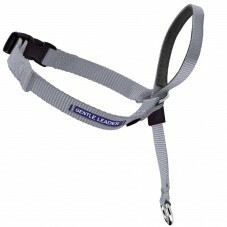 Instead of using a collar and leash you can use a head halter, but be very careful and follow the instructions exactly. When your dog is wearing a head halter, never jerk on the leash because abrupt stops can intensify neck injuries when his head is twisted to the side. Especially never use any kind of head halter with an extended leash. If your dog runs and then comes to the end of the leash, that can intensify any injury to your dog. 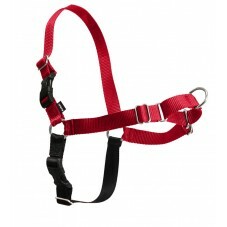 A harness is a better alternative than a collar, but the harnesses that have a leash attachment on the back can also promote pulling. Think about sled dogs which are strapped in via harnesses so they can maximize their strength and force by using their chest muscles. Don't get a harness that puts pressure on your dog's body in one particular areas such as his "armpits" because that can cause injuries as well. 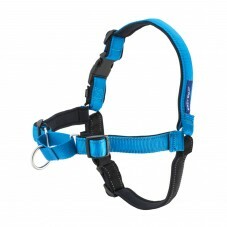 A harness that has a leash attachment in the front in the middle of the chest is a better choice because your dog is pulled off to the side when he starts pulling. These are only tools to help you in training your dog. Use a harness, headcollar, remote trainer, clicker, or other training tool to train your dog to heel next to you.